Fish ‘n chips is a staple among Australians. 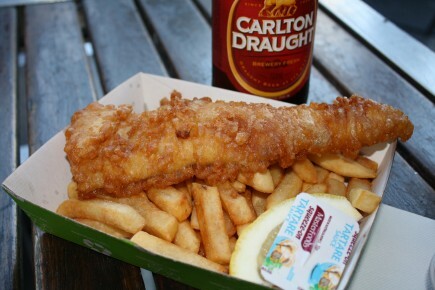 As is the case with England and most of its colonies, Aussies like their fish battered and deep-fried. The only difference in the antipodean fish ‘n chips (or fush ‘n chips in NZ) is the lack of malt vinegar that usually soaks through the bag. Aussies typically sample theirs with a squeeze of fresh lemon, salt and tartar sauce. The fish varies with the catch of the day and is invariably combined with chips (or French fries). For a flourish, you can often switch out chips for potato wedges. We washed ours down with the ubiquitous and flavorless Carlton Draught. We’ve enjoyed many rounds of fish ‘n chips but are looking forward to the American way of over-consumption when ketchup, or tomato sauce as it’s called here, doesn’t cost $.60 a packet.